After a series of these meetings, the group drafted The Privacy and Security Principles for Farm Data, or what today we call ag data's "Core Principles." These Core Principles represented basic guidelines that ag tech providers should following when collecting, using, storing, and transferring farmers' ag data. After publishing, 37 different companies signed onto the Core Principles, pledging to incorporate them into their contracts with farmers. To verify compliance with the Core Principles, AFBF and the other interested organizations and companies formed the Ag Data Transparency Evaluator, Inc., a non-profit organization (ADT) to audit companies' ag data contracts. This organization developed the Ag Data Transparent seal of approval (above). Much like the Good Housekeeping seal of approval verifies compliance with Good Housekeeping's standards, the Ag Data Transparent seal recognizes compliance with the Core Principles. How do companies get the Ag Data Transparent seal? 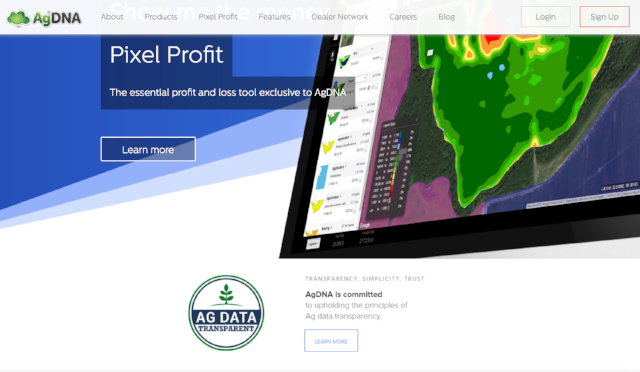 AgDNA's website provides a good example how companies feature the Ag Data Transparent seal. Many companies that collect ag data have not yet agreed to follow the ag data Core Principles. (Read: Few Big Ag Companies have yet to follow through on data transparency pledge). This should be step one. Many have signed onto the Core Principles, but not achieved the Ag Data Transparent certification. This should be step two. Ask your ag tech provider to incorporate the Core Principles into their contracts with farmers. Ask your provider to become Ag Data Transparent. Congratulate those companies that have already taken these steps. And let me know who would you like to see join the list next. *Janzen Agricultural Law LLC serves as the administrator of the Ag Data Transparent project.